2000-P Cheerios Dollar. Image Copyright: © 2014 James Bucki; All rights reserved. A Cheerios Dollar is a Sacagawea Dollar bearing the date 2000 that was inserted into boxes of Cheerios cereal in early 2000 as part of a U.S. Mint promotion to raise awareness about the new "Golden Dollar." A total of 10 million boxes of Cheerios were involved in the promotion, all of which included a newly-struck 2000 Lincoln Cent. A lucky 5,500 boxes also contained a Sacagawea Dollar, which was later discovered to have been struck from a different set of master dies then the regular Sacagawea Dollars. These rare coins, which quickly gained the moniker Cheerios Dollars, are considered to be pattern coins by most collectors. They can be distinguished from standard Sacagawea Dollars by the enhanced eagle tail-feathers on the reverse (see photo.) Very few specimens have come to light, perhaps no more than 60 or 70 total, and they are quite valuable, selling for $5,000 to $25,000 depending on grade. 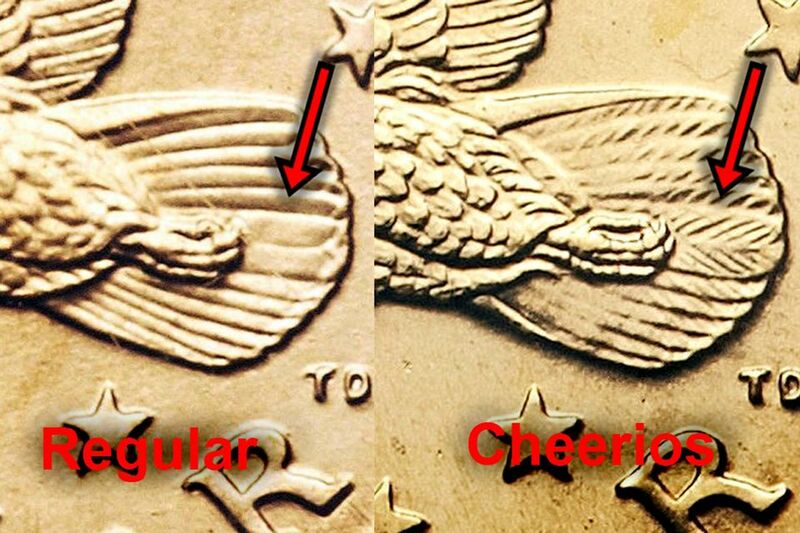 Numismatic researchers later discovered that not all of the Sacajawea dollars that were placed in the cheerio boxes have the enhanced tail feathers as initially thought. How Many Cheerio Dollars Are There? Some years ago, some experts from a third-party grading service opened a sealed box of Cheerios that contained the Sacajawea dollar. However, the dollar contained within the package was a regular Sacajawea dollar without the enhanced tail feathers. The cereal box appeared to be authentic, and There was no evidence that anybody tampered with the card carrying the Sacajawea dollar. Therefore, it is impossible to know exactly how many boxes of Cheerios contained a Sacajawea Dollar with the enhanced tail feathers. As coin collectors started to assemble a complete sets of Sacajawea dollars, they realized that there were two different varieties of the 2000 Sacajawea coin. They were first listed in the 60th Edition (2007) of A Guide Book of United States Coins (aka "The Redbook") by R. S. Yeoman. They are also listed in the Cherrypickers' Guide To Rare Die Varieties Of United States Coins, Fourth Edition Volume II, by Bill Fivaz & J. T. Stanton. Fivaz and Stanton describe the coin as "Enhanced Reverse Die" and gave it a catalog number of FS-C1-2000P-901. Nobody knows why so few Cheerios Dollars have come to light; some people think they were all spent into circulation, while others believe that they're just sitting in people's drawers and coin jars, waiting to be discovered. Regardless of the hypotheses that are circulating in numismatics, people are still discovering specimens. Some people have found them in "dealers junk boxes," and others have been found in circulation. So far PCGS has certified 107 examples and NGC has only certified two specimens. The highest price ever paid for a Cheerios dollar was $29,900 for a PCGS MS-68 specimen in the May 2008 Heritage Auction in Long Beach, California at the Signature Auction #1108. Now that you know what to look for, you should be looking at every 2000 Sacajawea dollar that you come across. Since there are dealers that are not familiar with this rare die variety, you should also ask to see their Sacajawea dollar specimens. You never know what you will find. What Is a Cheerios Penny?